For most Americans, the thought of Thanksgiving brings up fond memories of the dinner table piled high with delicious food, the family all gathered together, and the blissful snooze-fest after a full feast. However, the pièce de résistance of this favored holiday for many is, of course, the turkey. But while countless websites and TV shows talk about creative and unconventional methods for preparing a turkey dinner, one place in particular puts a twist on the traditional Thanksgiving by bringing this iconic bird to the table in a whole new way. Farm Sanctuary is a non-profit organization that rescues and rehabilitates thousands of farm animals from industrialized farming. Cows, chickens, pigs, and turkeys are allowed to roam free at one of the organization’s three shelters located in Orland and Acton in California, and Watkins Glen, New York. Each of the shelters offers guided tours and educational materials that highlight the realities of modern farming, as well as the animals’ stories of survival. 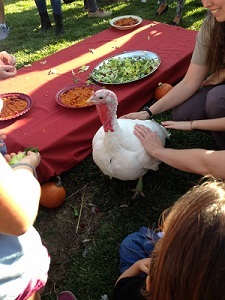 November is a particularly exciting time at the shelters, as each hosts a celebration for the turkeys. Guests are invited to buy tickets to the annual “Feeding of the Turkeys” ceremony, in which a flock of rescued turkeys take center stage and enjoy a banquet of salad, cranberries, squash, and pumpkin pie. Proceeds from the event go toward supporting the Farm Sanctuary and help keep its doors open for more animals in need of protection. If you would like to celebrate these noble birds, but are unable to visit one of the Farm Sanctuary’s locations, the organization also encourages people to sponsor the turkeys through the Adopt-a-Turkey project. With a one-time donation of $30, turkey sponsors will receive a certificate with a color photo and interesting facts about their sponsored bird. For the truly devoted, or turkey-obsessed, there is even the option of actually adopting a turkey through the Farm Animal Adoption Network, provided you can offer a safe, loving home to a rescued animal and meet a number of adoption qualifications, of course. No matter how you decide to spend Thanksgiving, whether peacefully slumbering on the couch or feeding a plate of cranberries to a turkey, we hope you have a wonderful time celebrating with loved ones!